Below is an excerpt from a research article Rebecca Edwards wrote on Student Engagement that was originally published by Educational Research Service and is currently offered by Education Week. Student achievement gaps receive a great deal of attention in the United States. Articles and documen­taries remind us that, according to testing data, U.S. students are lagging behind students in other coun­tries in math and science at an alarming rate. Society is so consumed with these achievement gaps that it has pressured schools and educators to almost singularly focus on closing them. But if you ask people about the student engagement gap, what can they tell you? Can they point to neatly packaged statistics and studies regarding which stu­dents are engaged and which are not? 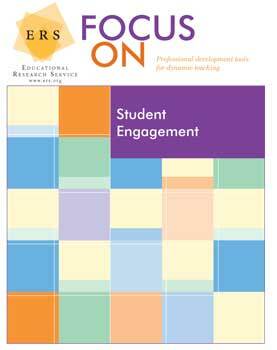 Even those working in the education field are alarm­ingly unclear about what student engagement is and, perhaps more importantly, why educators should be concerned with increasing student engagement in their classrooms. Focusing first on increasing student engagement, rather than on improving test scores, can actually foster greater gains in students’ academic, emotional, social, and behavioral achievement (Klem & Connell, 2005). Students often complain of being taught content and information over strategies and skills. When asked what increases their engagement in and connection to school, students’ responses are not surprising: more hands-on activities, relevant curriculum, interesting material, and—most influential to student engagement—caring, interested teachers (Yazzie-Mintz, 2006). In order to increase student achievement in the class­room, students need to be engaged in ways that honor their innate ability to multitask, network, and shift di­rection quickly. While it is not necessary to abandon student assessment and data analysis in order to focus solely on student-determined, self-directed learning, it is essential for educators to focus first on skill devel­opment and student engagement methods as a means for increasing academic gains and student success. Together with students, educators must view learning and educational success as a blend of content and skill mastery, each dependent upon the other, and neither mutually exclusive—but both relying on student’s engagement in the classroom and with the material. How Does Student Engagement Happen?